From time to time it is important to reflect on the advancements of the technology, craft, and skill used in generations past and how the development of those areas led us to what we have today. One of the drawbacks of the advancements in digital photography is the degradation of diminishing (or limited) resources. What I mean by this is, as digital photography has allowed us to shoot without pause, as with each press of the shutter we are not using any film, but an endlessly reusable and configurable memory card. While this advancement allows great advancement in technology it comes at a cost for those who are learning the art and craft of photography. All too often in the digital realm "we" don't slow down enough, we speed through the composition, we experience less through the lens before we fire off that burst of digital captures. So from time to time I like to go back to the basics to find that feeling of shooting with film, a volition, short lived medium by comparison to our digital cameras. Getting absorbed in my viewfinder, working the composition and framing to satisfaction before even thinking of pressing the shutter release is a zen-like experience. Using film helps me to slow down, and live in the moment I am trying to capture, and enjoy the surroundings in a way I often let slip by when shooting digital. A short time after the holidays I decided to try something a little different for a change, instead of grabbing my trusty old Nikon D300s and heading out to grab some shots, I thought I would dust off my old 35mm camera and go shoot a roll of film. So that’s exactly what I did. I grabbed my Olympus OM-1 35mm camera (circa 1974) cleaned it up and set out to have some fun. Of course as soon as I got it out and was getting all excited to start firing away I realized I needed a few things like film, and of course a new battery. As luck would have it there is still quite a bit of film out there, and the folks over at lomography have quite a selection. You can get a nice variety of 35mm or 120 size film from them, and they sell local in many retail stores (Urban Outfitters is where I found mine). 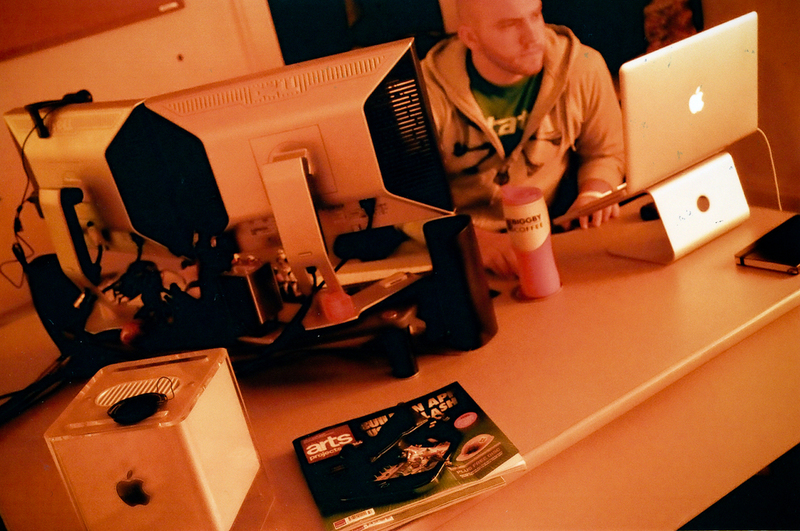 Just for fun I went with the redscale 100 speed film. I ended up having to order a replacement battery online through Amazon since none of the local stores near me carried the right size, so if you are planning to take out your old camera, might want to think ahead on that one and get your batteries and film now. Once I had my film loaded I was ready to set off and shoot some frames. It was so much fun yet simultaneously torturous to shoot a frame and not be able to look at a viewfinder and check to see if its properly exposed or sharp. Knowing I only had 36 exposures to a roll I found I became really stingy with my shots. I passed alot of shots that I normally would take and found that I played it safe many of the times by bracketing my images of the things I was really interested in. One of the things I loved most about this fun little exercise was that it was so refreshing to revert back to the basics, and rely on my own ability to expose an image correctly, knowing I would have to wait to get my film developed to see if I had missed the mark or not. I was about a third of the way through my roll of film when I remembered that there was not going to be any exif data on my finished images, which prompted me to drag out an old notebook so I could write down my shutter speed and f-stops manually…as fun as that is, boy does it make me love my digital SLR all the more. After shooting through a roll I found that I got better and better as the exposures went on, at first I overexposed my images quite a bit, but by the end of the roll I was getting some good results. The redscale film gave a nice vintage look to the images, unfortunately I did have some trouble keeping the snow or other white surfaces from washing out. I found that for an ISO of 100 the film was sure noisy, but after all it was pretty inexpensive film so I just made the most of it. One thing I did like about this film, was shooting more colorful things like vivid LCD screens as the vivid colors I feel look pretty interesting in a juxtaposition with the old styled film. Of course I was also reminded how costly those bad images can get, not only wasting the film, but without my own dark room sending these off to be developed cost another $12 or so costing me about $0.30 every time I clicked the shutter. Knowing the unused frames each came at a cost, it really helps to slow down and work over the entire frame before committing to a photograph. My challenge to all my fellow photographers is to take an afternoon or a weekend, and as a great challenge for yourself and for some inspiration grab an old 35mm and head out and shoot a roll the good old fashioned way…its a fun way to get back to the basics and to step away from all the fancy tools and equipment we have in our bags if just for few hours. I suppose if you don’t have a 35mm handy you could always tape over your LCD and only let yourself shoot 36 images at a time before you load them to see how they turned out.